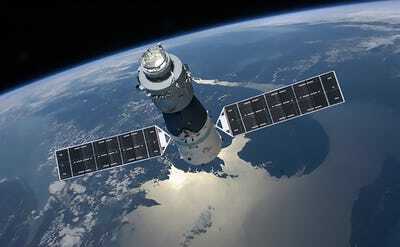 The Chinese modular space stationTiangong-1, launched in September 2011, is about to fall to Earth. It was used to practice space docking and served as a prototype for a future permanent Chinese space station. While operational, Tiangong-1 was visited by two crews of taikonauts. Sometime on April 1, give or take a day, the Chinese space station Tiangong-1 will fall into Earth’s atmosphere. The thicker air of the atmosphere will tear solar panels and antennas loose, melting and disintegrating much of the structure. Some material will stay intact, however – especially densely layered parts like engines. It’s possible that compartments and parts of the station could survive re-entry and hit the ground – or more likely, the ocean – on Earth. Tiangong-1 – the name means “Heavenly Palace” – is a 34-foot, two-room, 9.4-ton vessel that was launched into orbit at the end of September 2011. One of the main goals was to have a station that could be used to practice docking in space, which is essential for further space exploration, including the use of larger space stations in the future. Tiangong-1 also served as a prototype for a permanent 20-ton space station that China is planning to launch in 2023. “It conducted six successive rendezvous and dockings with spacecraft Shenzhou-8, Shenzhou-9, and Shenzhou-10 and completed all assigned missions, making important contributions to China’s manned space exploration activities,” said a memo that China submitted in May 2017 to the United Nations Committee on the Peaceful Uses of Outer Space. No visitors arrived at Tiangong-1 after that second crew, but the station was still used to gather data and observe Earth’s surface, monitoring ocean and forest use, according to Space.com. Since then, the space station’s orbit has slowly decayed. As its altitude has decreased, gravity has caused its falling speed to increase. Now we’re all just waiting for the fireball and to see where the debris lands.